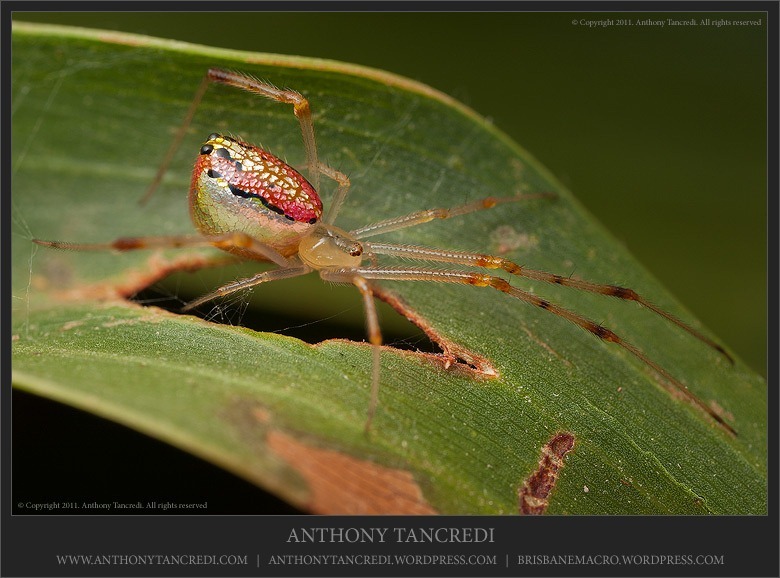 There are few spiders in my shooting area that are as flamboyantly decorated as the “Neon” spider. The reds and yellows on the abdomen almost glow in the light and even the apparent white sides are in fact a highly reflective metallic silver, almost akin to aluminium foil. I usually find this species sitting atop a flat leaf, generally in acacia trees, and almost always entangled in there own thin webs which they spread out flat over the surface of the leaf. There does not seem to be any concern for camouflage although there is suggestion that the large black spots on the rear of the abdomen are in fact a form of larger spider mimicry. 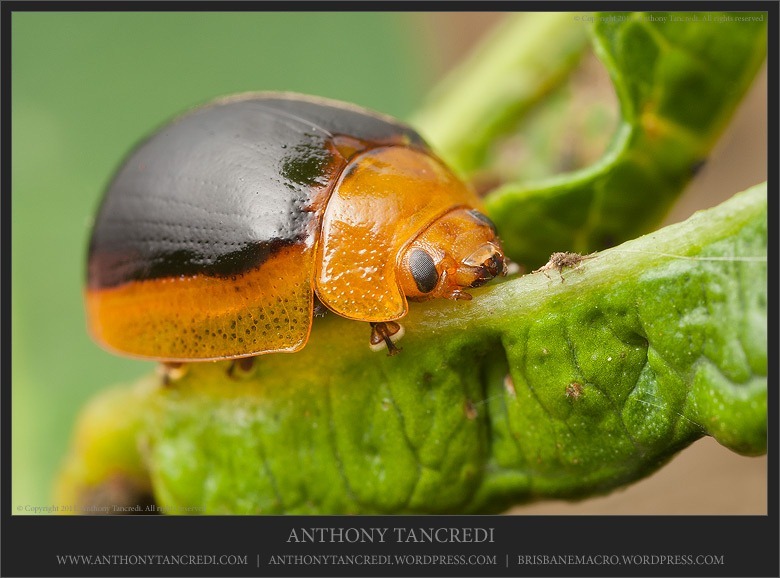 While I enjoy shooting this species, their incredibly shiny and reflective surfaces pose a lighting challenge and provide a good test of flash diffusion. It’s all too easy to blow highlights on this subject, particularly on the silver sections of the abdomen! The variety of leaf beetles that can be found in most forest type settings is quite astounding. Ranging from plain drab browns through to a cacophony of bright colours on a single shell, there is no shortage in styles to run across when out shooting. Tucked away in the middle of the range in terms of looks is the Eucalypt leaf beetle. Also know as the yellow skirted leaf beetle, this species grows to around 10mm and feeds predominantly on eucalypt leaves. Leaf beetles are an ever present subject and become easier to shoot after getting to know their habits. Most tend to take one of two actions when faced with a camera lens… either turning and hightailing it in the opposite direction, or tucking their legs under their shells and rolling off the leaf they are sitting on. With a little patience and learning what to expect, most species however are easy enough to shoot, including this one. Whenever I approach leaf beetles now, I will usually bend another leaf underneath them in case they go for the tuck and roll approach, which is exactly what this one did. I was then able to grab a few shots before I let this one scurry away. Sometimes when out shooting I will run across subjects that I haven’t seen before. While it is always exciting to see something new, it also leaves you with the challenge of tracking down and identifying the species. With that in mind, I thought I would share a quick game of who am I to highlight the though process when trying to ID a subject. Who am I… Can you name this species? 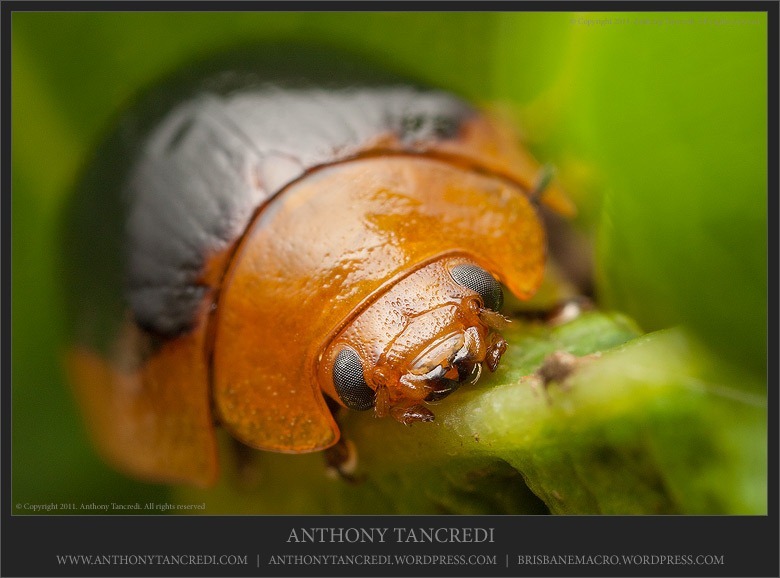 ANSWER: I am the larvae of the Steelblue ladybird (Halmus chalybeus)! Of all the spiders I come across when shooting amongst the various trees in my area, the ubiquitous pink flower spider is the most ever-present. 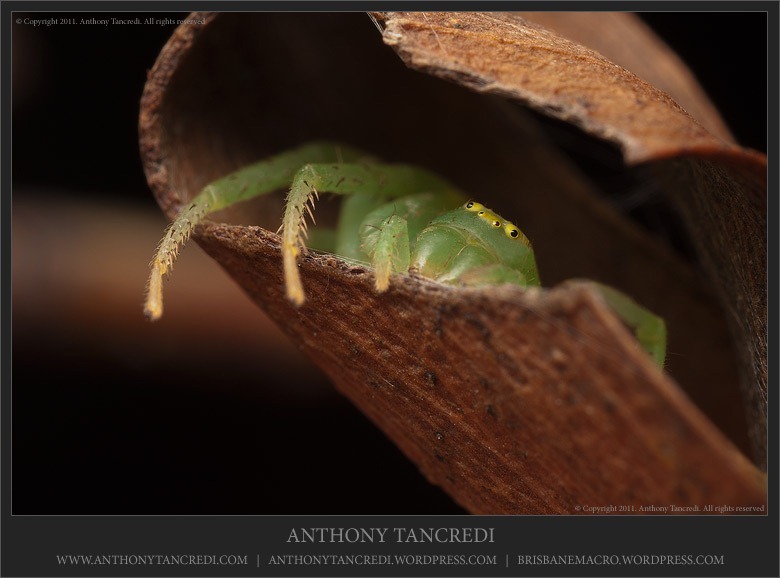 It is a rare outing where I don’t cross paths with at least several of these small green spiders. 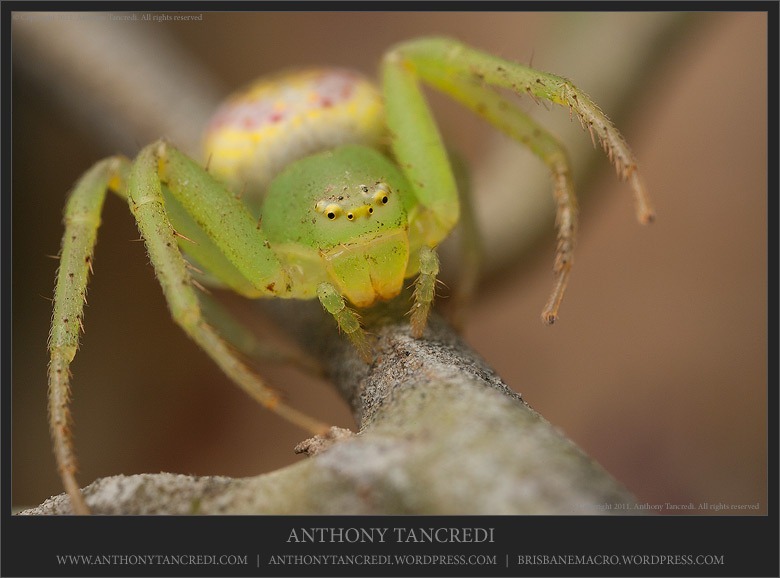 This species is a member of the Thomisidae family, also known as crab spiders and as such, they tend to employee the traditional “wait and watch” approach to hunting. For the most part they will sit in plain site, using a fork made by two small branches as camouflage. When the camera’s lens approaches they tend to move out of the fork and assume a more threatening posture, although I have never seen one actually move towards the lens. Sometimes it is possible to find a subject that would prefer to retreat into its shelter for protection. Usually, a nesting female would exhibit these tendencies and I would be reluctant to follow for fear of disturbing her maternal instincts. On this occasion, I carefully checked the shelter and found it clear of any sort of nesting activities. With that in mind, I was happy to grab a different sort of shot to those I normally take of this species. Extreme care was still taken to ensure the site was not disturbed in case nesting was about to happen. As such an ever-present accompaniment on most of my outing, I have come to appreciate and enjoy photographing the pink flower spider. It’s nice to find a different angle on a common subject sometimes though! As the effects of a dry winter start to wane, the first signs of spring begin to present themselves. There is no better indicator of this then the profusion of colour that is associated with the first flowering of the local wattle trees. As the trees burst forth in a proliferation of yellow flowers, the early emergers of the insect world start to congregate around this new food source. And as with most forms of animal life, where there are congregations of insects there will also be predators lurking. 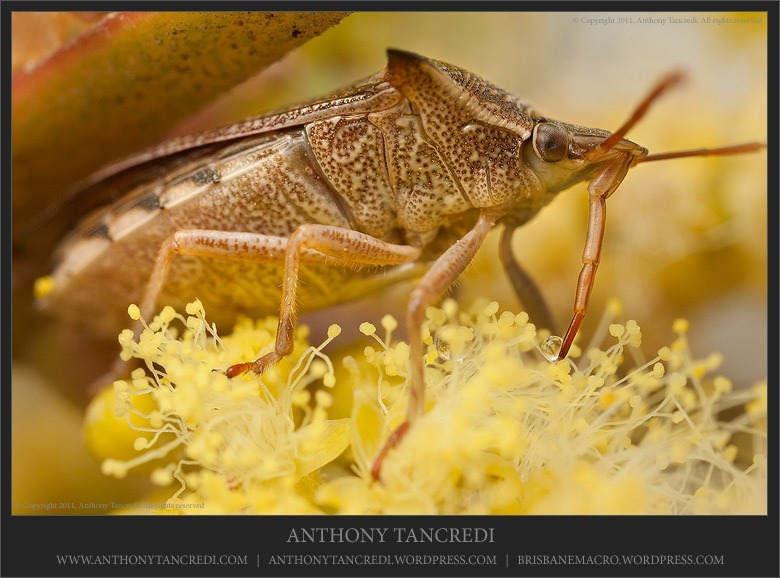 In this instance, a spined predatory shield bug (Oechalia schellenbergii) sits nestled amongst the flowers waiting for prey to come within its reach. 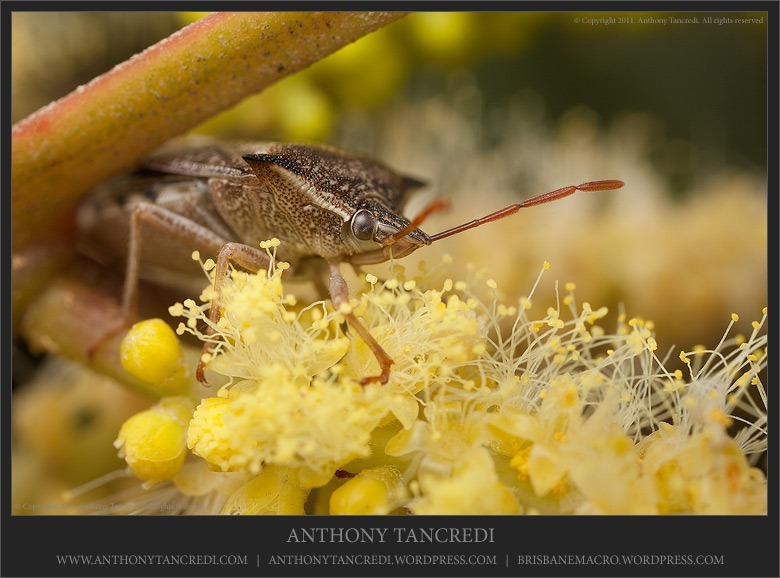 Interestingly in the second shot above, the shield bug can be seen blowing a small bubble of liquid from it’s mouthparts. This is the first time I have witnessed this behaviour in a shield bug, but have previously noticed something similar being performed by a paddy bug. On a technical note, shooting amongst these sorts of flowering trees can be a little tricky. Not only can the bright yellow flowers cause problems with exposure, but it can also be somewhat difficult to physically get the lens in to the subject! With a bit of patience and by keeping your eye on the cameras histogram, these challenges can certainly be overcome though. You are currently viewing the archives for August, 2011 at Brisbane Macro.